If you have some serious money to spend on a guitar you could buy a vintage instrument or opt for a top-of-the-line factory made model from one of the American big boys. But some of the smart money will always go to custom builders who can build a guitar to suit anyone’s specifications. Martyn Booth started playing around with guitars when he was 14 and after 10 years this hobby became his profession. By the late 1970s he was employed by Norlin and he learned his trade rebuilding road weary Gibsons. He soon went freelance but Booth ending up doing so much work for Yamaha and Fender that Yamaha eventually offered him a job and the opportunity to design as well as fix guitars. A reworking of a design that Booth had originally developed in 1979 evolved into the legendary Yamaha MSG (or ‘Image’ as it was known in the US). Although this model only stayed in production between 1988 and 1991, it retains a cult following to this day; big name enthusiasts include Mick Abrahams and Captain Sensible. After leaving Yamaha, Booth was snowed under with repair work. However, his desire to create coupled with the continuing requests for MSG-style guitars inspired him to resurrect his original design. The current body shape is a smaller, slimmer version of the guitar Yamaha produced. In essence it combines a Les Paul-style set mahogany neck with a maple capped mahogany body and the scaled down outline of an ES-335. This provides the starting point for all Martyn Booth guitars but everything else tends to be a collaborative effort with the person ordering the guitar as they are all custom made. You can decide on the neck dimensions and fret wire or specify chambers for a lighter body and a more semi-solid tone. Choose between ebony and rosewood for the fingerboard and select your own pickups. The bridge can be tun-o-matic, a Junior style wrap over or even a Hipshot vibrato. For the ultimate personal touch, customers can specify their own individual headstock inlay, and Booth will never replicate the design – not even for the same person. Now that’s what you call a one-off instrument! 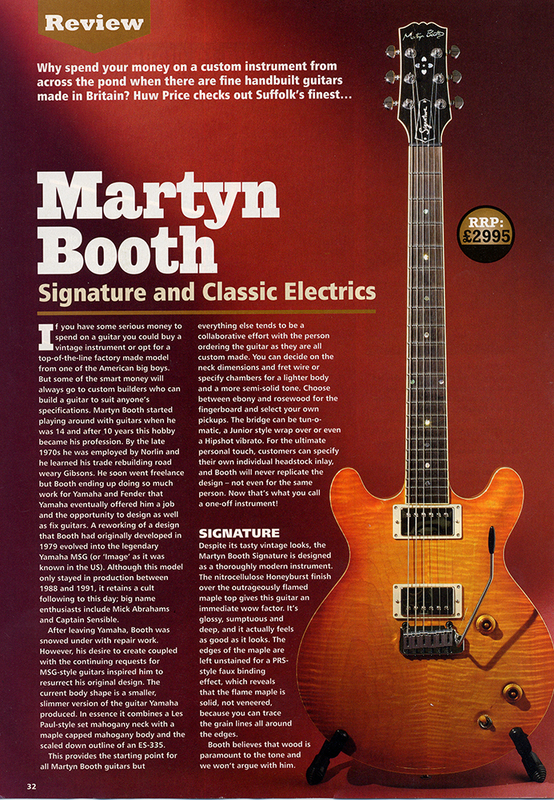 Despite its tasty vintage looks, the Martyn Booth Signature is designed as a thoroughly modern instrument. The nitrocellulose Honeyburst finish over the outrageously flamed maple top gives this guitar an immediate wow factor. It’s glossy, sumptuous and deep, and it actually feels as good as it looks. The edges of the maple are left unstained for a PRS· style faux binding effect, which reveals that the flame maple is solid, not veneered, because you can trace the grain lines all around the edges. Booth believes that wood is paramount to the tone and we won’t argue with him. When selecting timber you’ll find Booth trawling lumber yards with a mallet and a tuning fork looking for Brazilian mahogany blanks that really ring. In fact, Booth believes that everything hinges on the mahogany because maple isn’t a particularly good tonewood. Most of us have grown up accepting the mantra that mahogany provides the warmth and depth while the maple provides the brightness. Booth believes that maple tops are mainly used for their looks and their main tonal contribution is to quieten down the mahogany. Rather than adding top, they attenuate the low end and help to clean things up. However, he cautions against making the maple too thick because it can stiffen the guitar too much. So Booth restricts his maple tops to a thickness of no more than 14mm in the centre. Equally important is the quality of the neck joint. Booth believes that bolt on and set necks can work equally well but the crucial factor is to create the tightest possible joint and maximize wood-to-wood contact. Judging by the mahogany neck joint and the crisp carve of the maple top on the Signature we have here, Booth is capable of some surgically precise woodwork to back this up. The headstock is a study in understated elegance and the narrow width allows the strings a fairly straight run from the slippery Graph Tech nut to the locking mini-Grover tuners. The headstock and neck are bound in cream and the abalone Martyn Booth inlay looks jewel-like against the ebony fronted peghead. The pearl inlay design is a simple affair with four hearts. It was chosen because this guitar was built as a show model. It has also seen some gigging action, however, having just returned from a Cockney Rebel tour. There is more abalone in the form of dots along the Rio rosewood fingerboard and the fretwork is immaculate with no rough edges or flat spots. The Signature’s humbuckers with cream surrounds are a fine match for the maple and beneath metal covers you’ll find a Seymour Duncan Jazz at the neck and a JB at the bridge. The browned-up button on the three way pickup selector is a nice touch and the vintage style gold master volume and tone knobs are a perfect choice. Although the basic flavour is vintage Gibson, there are a couple of Fender style features, including the rib rout at the back and more surprisingly the Hipshot vibrato bridge. This is a state-of-the -art non-locking device with low friction knife-edge pivots, a light action and a smooth surface for your picking hand to rest on. And if you need some of that Fender twang to go with it, the tone knob doubles as a push/push coil-tap. Booth’ s point about maple caps is evidenced by the Signature’s acoustic tone. There’s no shortage of sustain or resonance but it does sound far more controlled and well mannered than an all-mahogany Gibson SG. There’s also plenty of high-end sprang but the midrange is not as thick. The strap balance is fine and the slim neck is fast and very playable, aided by a flawless set up and spot-on intonation. The neck pickup manages a hi-fi rendition of the unplugged tone with a sweetness that blues fans will love. The bridge pickup has a harder rocking sound and the in-between setting has really rich, open character. The control layout is superbly ergonomic: the positioning of the volume control is just about perfect and the push/push action of the coil-tap switch is faster and simpler than either a push/pull or regular switch. Like many other custom makers Booth sticks to a limited number of key models. The body of the Classic is identical to the Signature’s, complete with the ‘binding’ strip of clear-coated maple. This time, however, the black colour covering the body and neck is polyester with topcoats of nitrocellulose. If it’s good enough for PRS it’s good enough for Booth! The name is apt because the Classic is intended as a more traditional guitar, closely following the Gibson Custom formula with gold plated hardware and an ebony fingerboard. Other differences from the Signature include pearl dot markers, full-sized Grover tuners, a Tusq nut and, more crucially, a tun-o-matic bridge and stop tailpiece. The control layout and switching is just the same but an exquisite inlaid pearl swan floating on a pool of blue abalone graces the redesigned headstock. Acoustically the Classic feels just as lively as the Signature but there’s an extra-high frequency shimmer. To my ears guitars with ebony rather than rosewood fingerboards always sound brighter, but the tun-o-matic here influences the tone just as much. This is a big sounding guitar with a precise and biting attack. Predictably, it’s far more reminiscent of a really good Les Paul but there is more tonal variation between the pickups. The bridge unit provides a raunchy bark and the neck has a sweet transparency. So the overdriven tones are ideally suited to rock, blues or fusion but the Classic manages something quite rare for dual humbucker guitars – it’s good for clean sounds, too. By nature, the Classic is brighter sounding than a similarly equipped Gibson and neither of the humbuckers sound nasal or honky. The neck is woody, jazzy and slightly mellow while the bridge generates extra midrange aggression and grunt. Their output levels are evenly matched so blending them produces a full frequency spectrum with lots of mahogany-textured complexity. 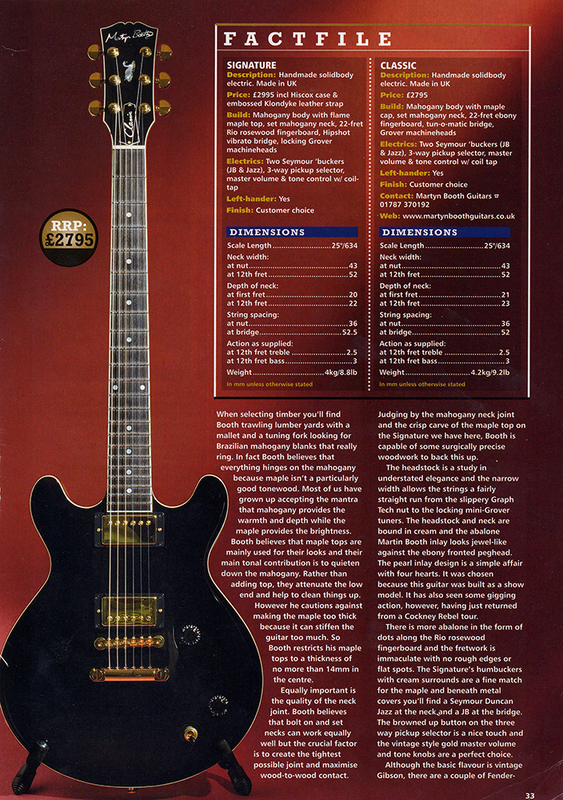 I was impressed when I recently tried a couple of top-end Gibson SGs, although they were unmistakeably production line guitars. Both these Martyn Booths are as well made as the Gibsons yet they feel truly hand built. To use a car analogy, I imagine it’s like the difference between a Mercedes and Aston Martin. Unlike the SGs, the Classic and Signature don’t feel like they need a period of playing in to sound their best. The Classic is not quite as woody and articulate as the Signature, or even as expressive, but it nails that classic rock vibe more convincingly and many players will find it slightly more fun. However, if you need a broader range of tones and you play clean and semi-dirty just as much as you play distorted, you’ll find the Signature a more well-rounded performer that can deliver at least 90 per cent of what you want from a guitar. 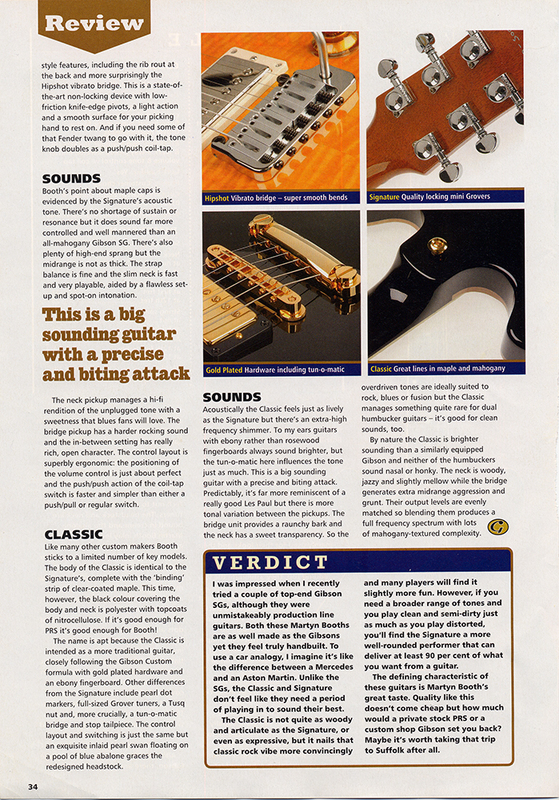 The defining characteristic of these guitars is Martyn Booth’s great taste. Quality like this doesn ‘t come cheap but how much would a private stock PRS or a custom shop Gibson set you back? Maybe it’s worth taking that trip to Suffolk after all. Looks familiar? Yes, it’s a slimmer, all handmade version of the Booth-designed Yamaha MSG of days gone by. It’s got all the goodies: nitro finish. flamed maple top, a slim and speedy neck, flawless fretwork, unstained faux binding, locking mini Grovers, a light-action Hipshot vibrato and even a personalised pearl inlay. Ultimately the sound will depend on your choice of pickups but our sample’s SD JB and Jazz units translated the Signature’s natural resonance well, with plenty of high-end sprang. The midrange isn’t too thick and the neck setting has a delicate sweetness that blues fans will love. The bridge pickup rocks harder, and the middle position is full of character. This could be your lifetime number one electric.